The internet puts the world at your fingertips. From laughing at your favorite shows to shuddering at the news, anything you want to access is just a click away. But that may be worrisome if you’re a parent or teacher. Children often have access to multiple devices. Make sure to project each of them by implementing parental controls. 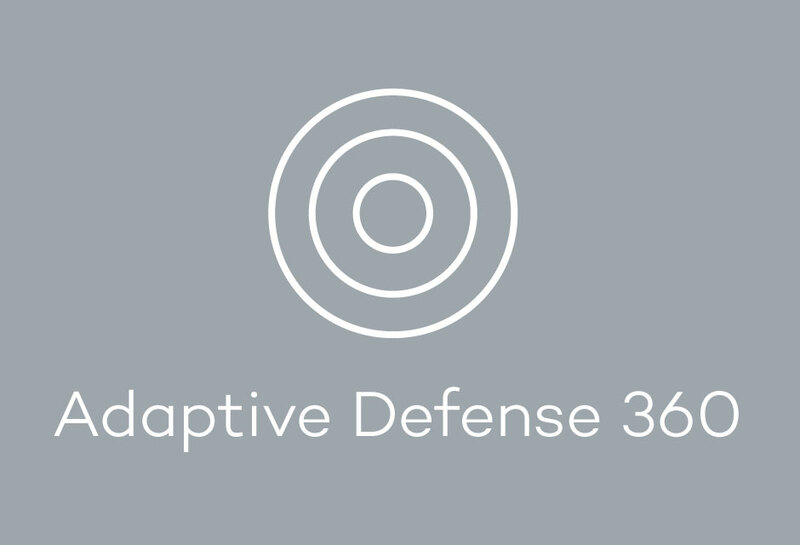 They are available on most major internet-enabled devices such as computers, smartphones and gaming systems. Parental controls help reduce the risk of your child viewing inappropriate content on the web. In addition to setting parental controls, it’s important to monitor your child’s internet activity and use age-appropriate settings on devices. 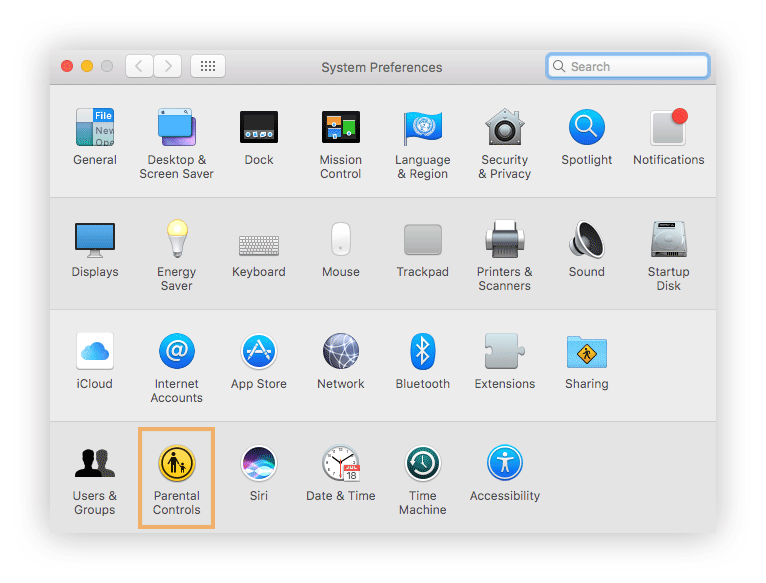 Most computer operating systems contain parental control settings to ensure your child is safe from the minute they turn on their device. Head to this page and sign in with your Microsoft account. Set up a child account through Windows Settings. If you already have one, find your child’s name and choose Content Restrictions. Go to Apps, games & media and toggle Block inappropriate apps, games and media to On. Under Allow apps and games rated for, choose the age limit you’d like to apply for your child. When your child requests to access a blocked application or game, you can approve it by going to Content restrictions and adding it to the Always allowed list. In the case that your child downloaded something prior to these limitations, you can block it by going to the Activity page. Your child will need permission to use it again and you can approve or disapprove via email. Sign into your Microsoft account using this page. Find your child’s name and click Content restrictions. Scroll to Web browsing and toggle Block inappropriate websites from off to On. For blocking specific sites, add their URLs under Always blocked. To limit your child to only browse specific websites, check the box next to Only allow these websites. Find your child’s name and then choose Content restrictions. Toggle Needs adult approval to buy things On. Approve or deny their requests through your personal email or on account.microsoft.com/family. Choose the user account on the left side of the window that you want to enable filtering for (your child’s account). Note: Parental Controls cannot be enabled for administrator accounts. Make sure your child’s account has managed access and is not an admin. Choose one of the three modes under Website Restrictions (unrestricted, automatic, whitelist). “Allow unrestricted access to websites” (unrestricted): This logs websites that the account visits, but does not restrict web browsing. Parents can view visited websites under the Logs tab of Parental Controls preferences. “Try to limit access to adult websites automatically” (automatic): Filters websites with inappropriate content similar to the way mail applications identify “junk” mail. This filter can identify whether a web page is safe or not by inspecting the website’s text and structure. It also blocks websites if the website identifies as adult-oriented using RTA or Safe Surf rating systems. 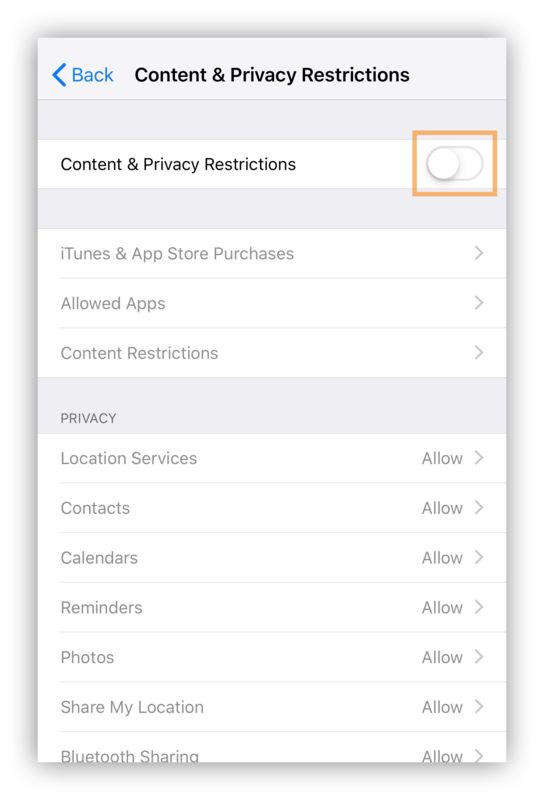 This setting logs all visited and blocked websites, and flags blocked websites in the Logs tab of Parental Controls preferences. The internet content filter cannot examine the encrypted content of a page (https or SSL encryption). For this reason, encrypted websites must be allowed using the Always Allow list. If not, the encrypted websites will automatically be blocked. “Allow access to only these websites” (whitelist): This will restrict any website that is not listed. Click on your account photo located in the lower right-hand corner of the screen. When the pop-out window appears, choose the gear-shaped icon for Settings. Scroll down to the section People and click Manage other users. The Users interface should be visible. Select a check mark next to the Enable supervised users setting. Then select Done to return to the previous screen. Click on your account photo again and select Sign out. Select Click More at the bottom of the screen with three vertical dots. Then select Add supervised user. Click Create supervised user. You’ll be prompted to choose the managing account for your new supervised user profile. Choose the desired account from the list and its password. Select Next to continue. Enter a name and password for the supervised user. Add an image and click Next. You now have a supervised profile and if successful, you’ll receive an email with more details. Now that you have the device’s OS system controlled, it’s time to start on internet browser parental controls. We have detailed instructions for the three most common internet browsers: Google Chrome, Firefox and Safari. 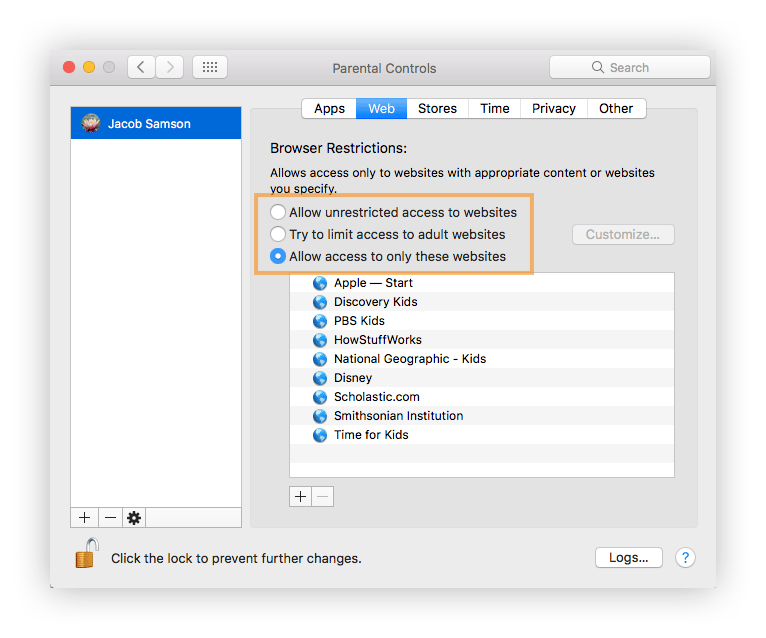 Listed above, safari parental control is the same as Mac OS parental controls. Click on the main menu button in the top right-hand corner with three vertical dots. Once the drop-down menu appears, select Settings. Select the section called People. Select Add person and select an image and a name for the new user. While creating this person, put a check in the checkbox next to Control and view the websites this person visits from [active user’s email address]. Next, click on Add and a new Chrome window will open. Once the profile for your child is created, you’ll want to select Supervised Users Dashboard and click on My Child. Here you can add parental control settings in the Permissions section and choose to “lock” SafeSearch. You can also see which sites your child visits in the Activity setting and approve/disapprove their requests to access sites. Firefox automatically checks the parental controls on your device and sets itself to Prefer:Safe mode. This will auto turn on the safety feature on each website your child visits as long as there are active parental controls on your computer. 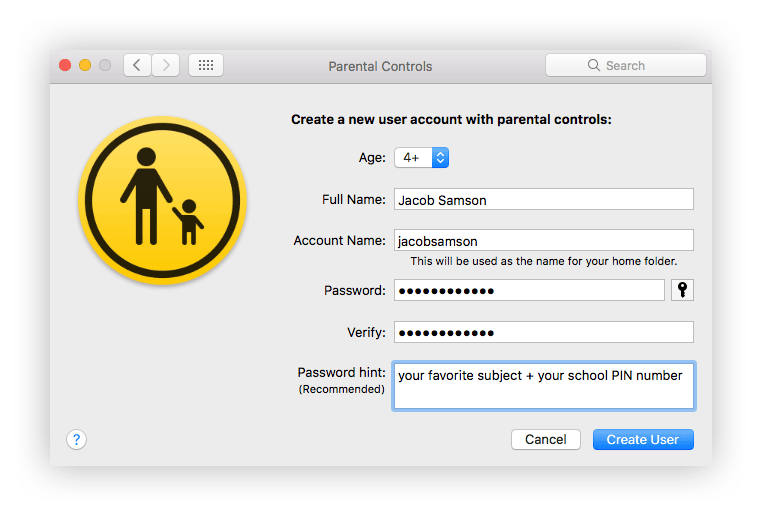 The feature can only be turned off through password-protected parental settings on your operating system. That way your child will not be able to deactivate this feature through the Firefox browser. 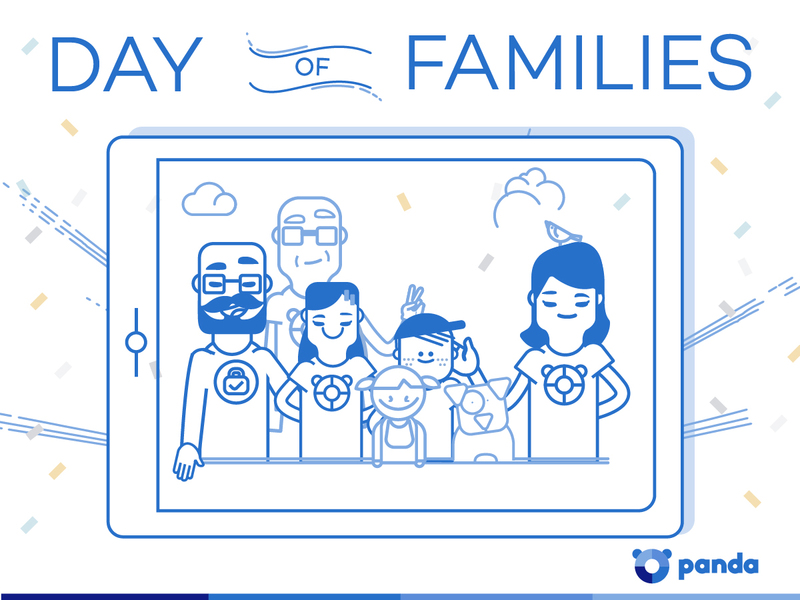 Here are Firefox add-ons for parental control. While your OS system and internet browsers may be secure, it’s important to implement search engine parental controls. Kids will most likely use search engines to find websites for recreational use or educational use. Make sure their search is monitored by adding parental controls using our guide below. Go to the Google search engine. At the bottom of the page click Save. Note: For added protection, change the SafeSearch filters setting from Moderate to Strict. Under Search and SafeSearch toggle on Strict. Open the Yahoo search engine in a browser or open the Yahoo search app and sign in. Search for a term, then scroll down to Settings at the bottom left of the page. Select your SafeSearch preference, then tap Done (if on iOS). When it comes to video content, there are millions of videos getting published daily. Keep your children protected from PG-13 to R-rated content with these parental controls for video streaming. We have added parental controls for the most common video streaming sites: YouTube, Netflix and Hulu. YouTube Kids has become available on both iOS and Android platforms. It is parental control enabled and filtered just for kids. YouTube Kids focuses its content on music, education and other categories. We recommend downloading this to their iPhones (if applicable) and/or keeping YouTube locked/passcode enabled if downloaded on your phone. If you still want to use the original YouTube app, follow these steps. Launch YouTube and sign in. Click on your profile picture on the top right of the screen and select Restricted Mode. It will then open a drop-down menu where you can toggle Restricted Mode on. For iOS, click on your profile and under Settings toggle on the Restricted Mode button. For Android users, the option can be found under Settings – General. 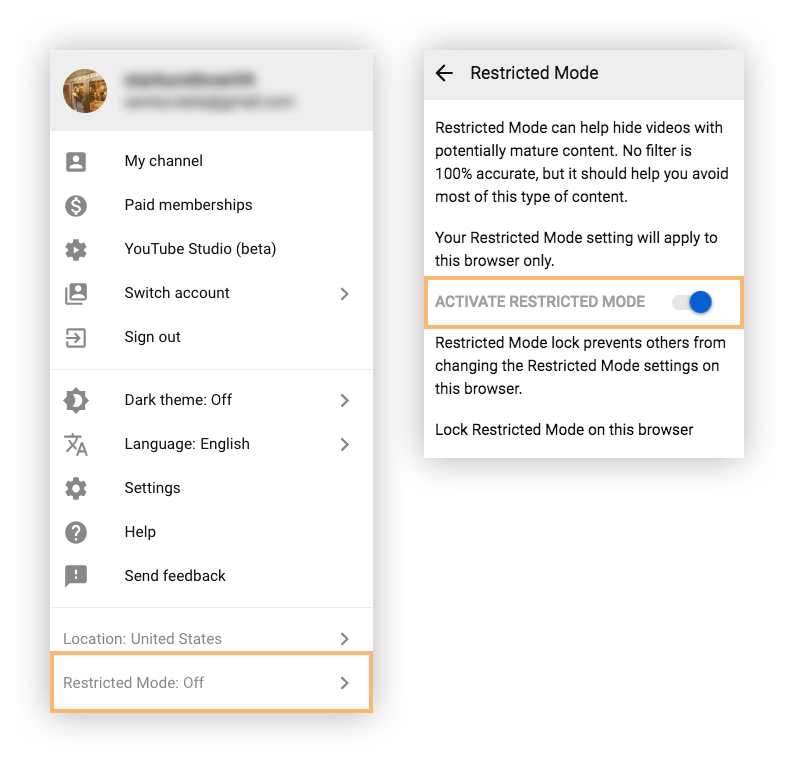 Note: In order to make sure kids do not turn off parental controls, sign out of your YouTube account in the browser/app and the settings will be locked. The settings are browser specific, so you will need to repeat for every browser. For Netflix, there are a variety of controls that you can choose from. They have hard and soft controls that parents can set up along with maturity levels for each individual profile. Little Kids: Only shows and movies suited for “all ages” will be available. Older Kids: Media rated all ages, 7+ and some 13+ will be available. Teens: Movies and shows suitable for teens (13+) will be shown. Adults: All listed media will be available. 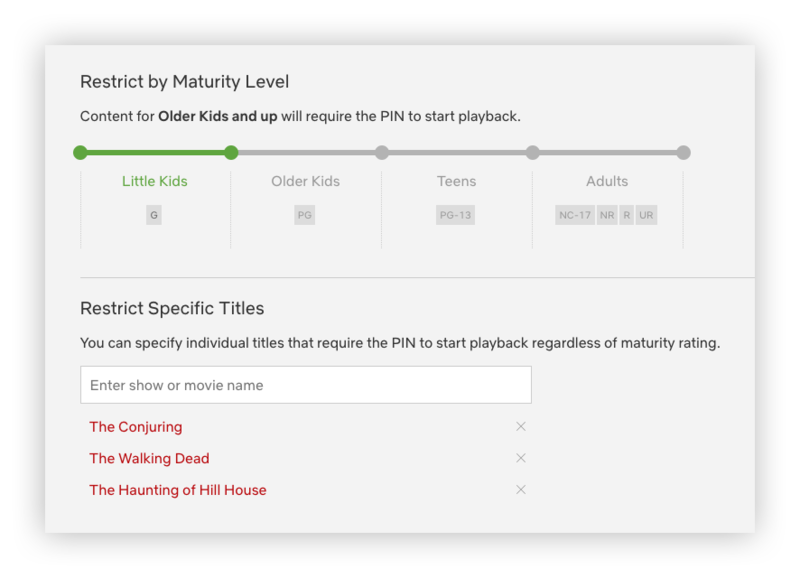 Requiring a PIN for specific maturity ratings: Set a 4-digit PIN that is required to play any video content above a selected maturity level on any profile. The PIN ensures that your child doesn’t watch content rated above the selected maturity level. Requiring a PIN for specific video content: Set a 4-digit PIN that must be entered to play specific video content on any profile. This ensures your child does not watch the particular video content. Go to your Account page from a web browser. Choose the link for Parental controls in the Settings section. Enter your Netflix credentials and select Continue. Enter four numbers into the PIN field — this will be your PIN. 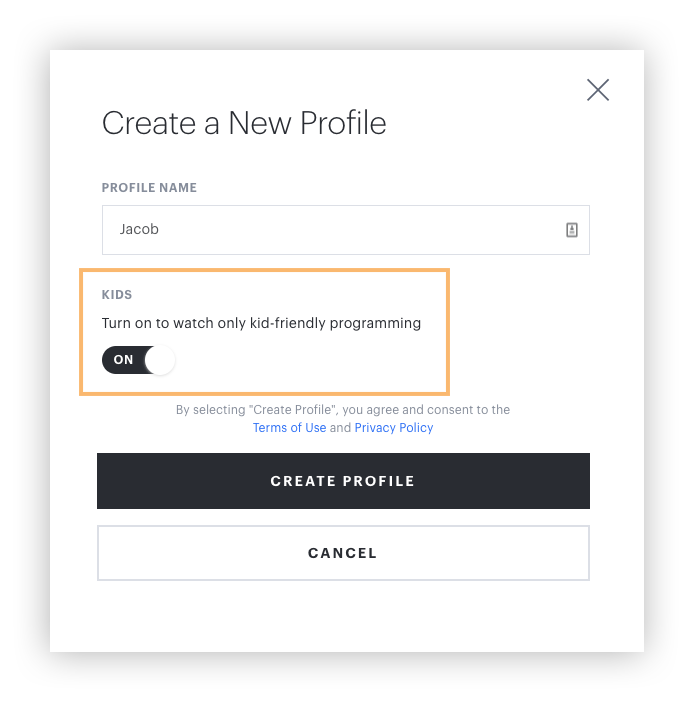 Choose a maturity level for a profile: Set a maturity level for a profile to control the video content available for that profile. The parent or guardian then ensures their child only uses their correct profile. Go to your Account page and select Manage Profiles. Choose the profile you’d to edit. Under Allowed TV shows and movies, choose your desired maturity level. Note: the primary account holder’s profile can only be set to For Teens and below or All Maturity levels. 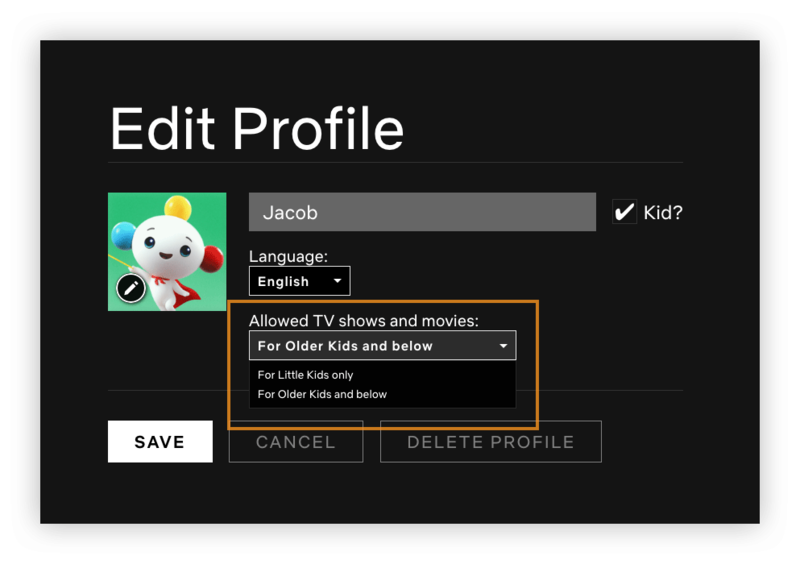 Hulu parental control is based on the age associated with your Hulu profile. 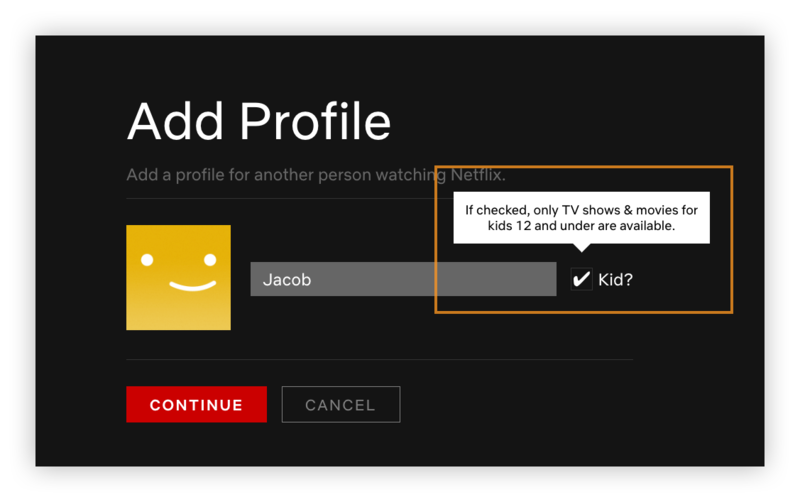 User accounts who specify an age under 17 will not be allowed to watch mature content (films rated R or TV-MA shows) using their individual profile. Hulu will also respect your device’s parental controls on devices such as an Xbox One. For Hulu Plus subscribers, there is a Hulu Kids section you can set up for your little ones. In many households, gaming is a popular choice for children and teens. It can even be a more popular activity than spending time online, so it’s important to make sure your parental controls are secure. Follow these how-tos for the most popular gaming systems. Sign in with your adult account on your Xbox. Select the Xbox button on the controller to pull up the guide. Select System > Settings > Account > Family. Choose the account you want to update, select Access to content and then select the appropriate age limit you’d like. 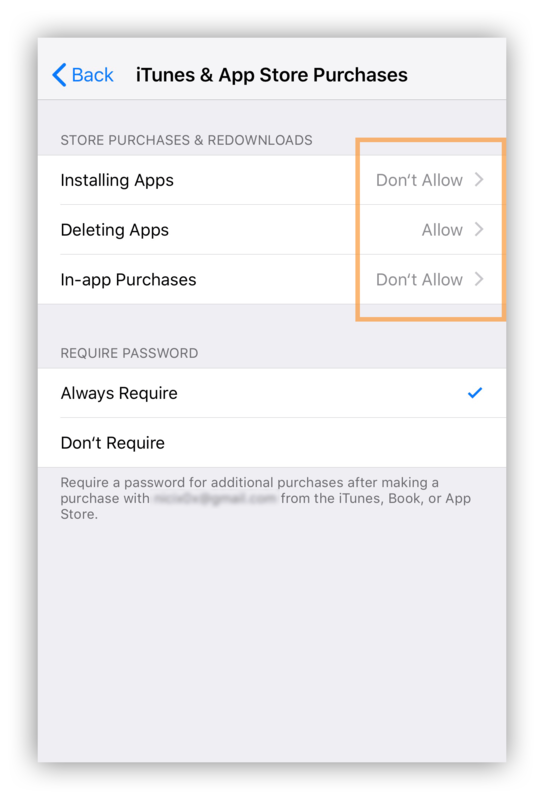 When your child requests to use a blocked app or game, you can approve and add it to the the Always allowed list under Content restrictions. If your child has downloaded something prior to setting these restrictions, you can block it on the Activity page. They will need your permissions to use it again. The permission request will be sent via email. Press the Xbox button to open up the guide and then choose System > Settings > Account > Family. Select your child’s account that you wish to add the web filters to and then select Web filtering. Select the drop-down to view all of the options. Sign in with your adult Account on the console. Press the Xbox button to pull up the guide, then choose System > Settings > Account > Family and choose your child’s account. Choose the user you want to set a spending limit for then select Applications/Devices/Network Features under the Parental Controls section. Select Monthly Spending Limit and press X. Go to Settings > Parental Controls/Family management > Family Management. You might have to enter your PSN account password. 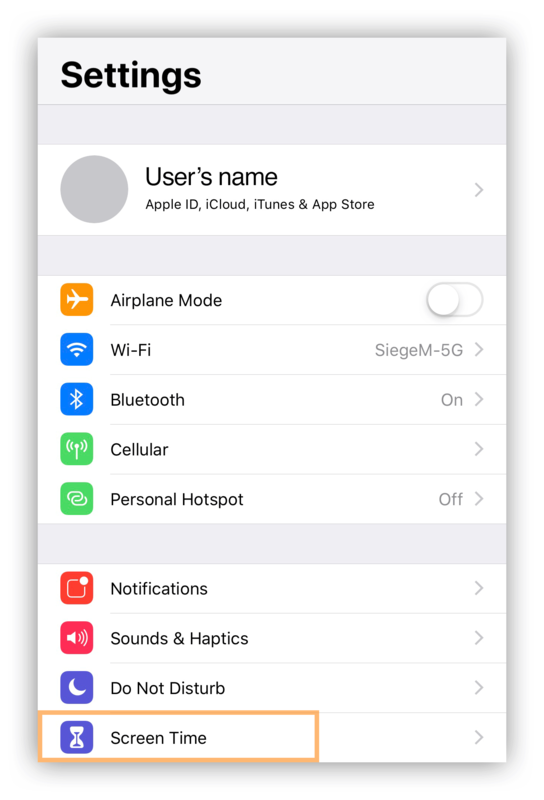 Select the user you want to set restrictions for and then select Applications/Devices/Network Features under the Parental Controls feature. Under Network Features you can choose to allow a child family member to communicate with other players on PSN or view content created by other players. Go to Settings > Parental Controls/Family Management > Family Management. You might need to enter your PSN account password. Select the user you want to set the age level for, then select Applications/Devices/Network Features and choose the content you would like to restrict. Information on age level here. On your system, go to Settings > Parental Controls/Family Management > Family Management. You might need to enter your PSN account credentials. Choose the user you want to set restrictions for. Then select Applications/Devices/Network Features. Scroll down to Use of Playstation VR/Use of Internet Browser and select not allowed. On your PS4 system, go to Settings > Login Settings > Login Passcode Management. Set a 4-digit passcode with the corresponding buttons on your DS4 controller. Enter the 4-digit passcode again to confirm. Once you’ve set the passcode, you can change or delete the login passcode at any time. Click on the blue arrows on the right to access Wii System Settings 2. Select Parental Controls, then Yes. Click “Ok” three times to begin the setup. Add your desired PIN and select OK. Input the PIN again and select OK. Choose a security question and then click OK.
Add an answer and select OK. Select Game Settings and PIN then The Highest Game Rating. Using the blue arrow, scroll through the ESRB ratings. Choose the desired rating restriction and then OK. Select Restrict for each desired setting and then proceed. Once your selections are made, select Confirm. On the Nintendo DSi Menu, select the Settings icon. Choose the right arrow twice to reach the third page, then select Parental Controls. Choose Yes, Next, then OK to reach the PIN screen. Select Next, enter your desired four-digit PIN then tap OK. Enter the PIN once again to confirm, then tap OK. Select OK again and enter a password to the secret question, then select OK. Select OK and then tap the left/right arrows to scroll to the game rating icon for the highest-rated video game that you think is suitable for viewing on the system. Select OK to continue. Next the system will take you through a number of questions where you will decide which features to restrict. Select Yes to block the feature or No to allow. Select OK to confirm your selection. Select Yes to save the Parental Control settings. Choose the control setting based on the age of your child for both games and films. If you are unsure which level to choose to prevent your child from playing a particular product, you can select the application or content from the XMB menu, press the Triangle button and then select Information. Go to Settings > Security Settings > Parental Control Level. Set the parental control level. Once the levels are set, users who are restricted will see a padlock icon in place of the normal icon for the game or application. The default level is at 9, which is the 18 age rating. Go to your Settings and scroll down to Security Settings. Then press the X button. Select Internet Browser Start Control and press the X button. Select On if you prefer to have the Internet Browser Start Control enabled. Then press the circle button twice to exit out of the Internet Browser Start Control menu. Whether your child has their own Android or Apple device or they use yours, it’s important to set up cell phone parental controls. You can turn off function such as in-app purchasing, restricting web search, and more. Tap Continue, then select Use Screen Time Passcode to create a passcode. Re-enter the passcode to confirm. 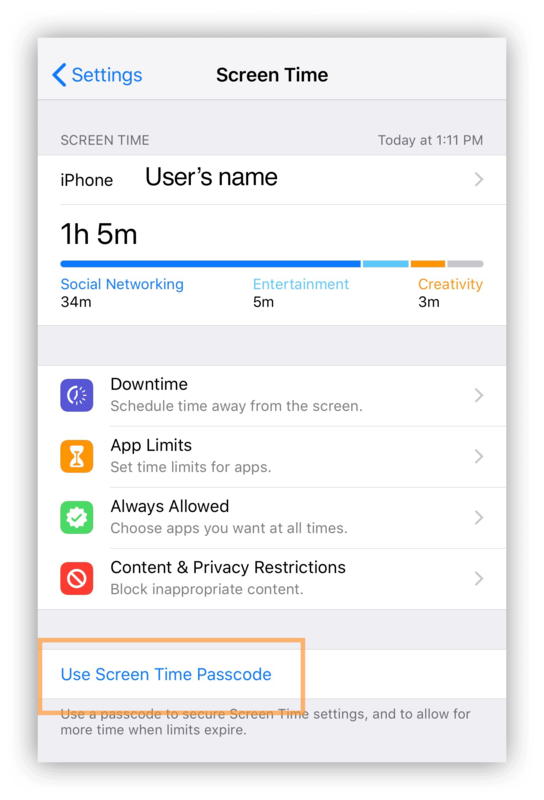 Note: If you’re setting up Screen Time on your child’s device, follow the prompts until you get to Parent Passcode and enter a passcode. Then, re-enter the passcode to confirm. Tap Content & Privacy Restrictions. Enter your passcode if applicable, then turn on Content & Privacy. Choose Limit Adult Websites, or Allowed Websites Only. Select Content & Privacy Restrictions. If prompted, enter your passcode. Make your selections on which to Allow under Store Purchases & Redownloads. Select Always Require a password. Tap Content & Privacy Restrictions, then choose Content Restrictions. Sign in with your own Google account or use their account if they have one. Launch the Play Store app and tap the three horizontal lines at the top left. Scroll down and select Settings, and scroll until you see Parental controls. 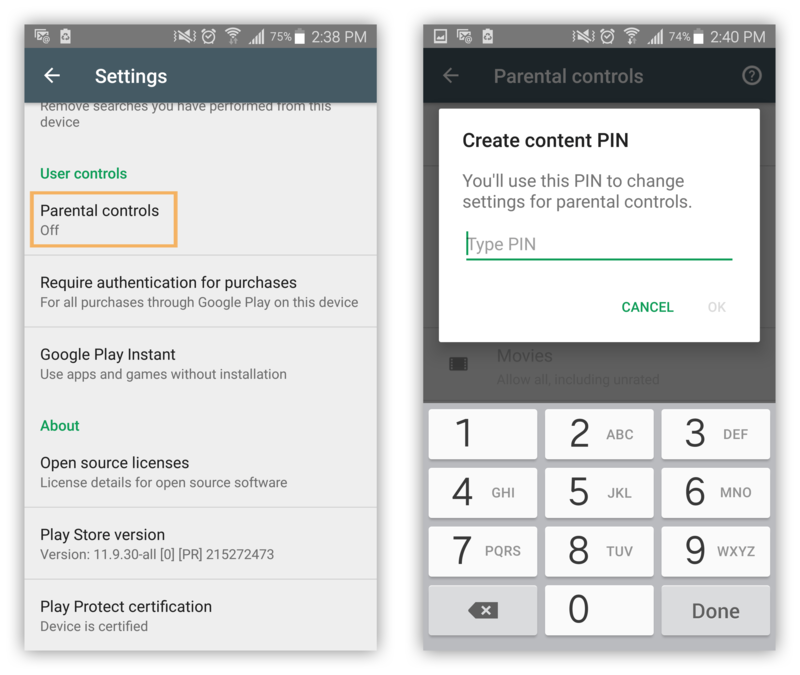 Tap the Parental controls and create a PIN code. Re-enter the PIN. The setting will be turned on and you can then tap each category to set how restricting you’d like each category to be. Download the Family Link app on your device. Launch the app and select Get Started. Choose Start on the Set up Family Link screen and follow the prompts to progress through the setup. Answer a few questions about whether your child has a compatible device and select that you want to create a child’s account and to start a family group. Enter your child’s first and last names and press Next. Add their birthday and gender, then press Next. Choose a Gmail username and press Next. Then add a password and press Next. Agree to the Terms and Conditions and add credit card information. To add the account on your child’s device, start by turning on their phone and signing in using their account. Then enter your own Google password and press Next. 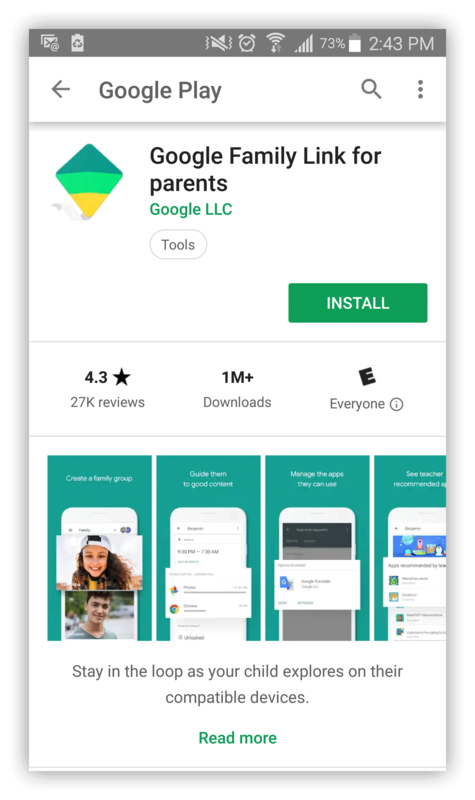 Family Link will now be installed on your child’s device. Note: Below the Parental controls master switch there is a summary of which restriction is set for each type of content. The final step you can take to secure your child’s online activity is with parental control apps. In the world of mobile phones and tablets, parental control apps are an added level of protection to keep your child safe. Read below for our top 10 parental control apps. Parental controls are necessary to keep your child safe while spending time online. Because of the variety of devices and internet platforms your child may use, it’s important to keep your parental controls up-to-date and active at all times. You should always make sure you and your child’s devices are armed with antivirus to ensure safe and protected online browsing sessions. 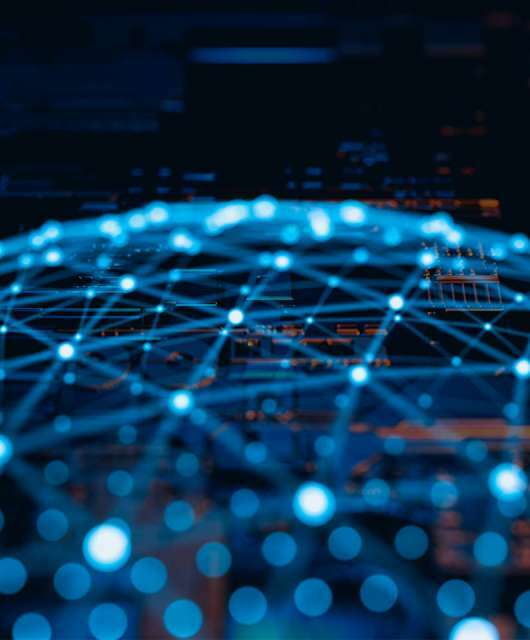 Panda Security’s antivirus allows system administrators to prevent users from accessing websites that contain unwanted content. It also features a GPS tracking system so you can always know where your children are. It can additionally block unwanted calls and allow parents/adults to block access to certain apps. Got a Free Antivirus for your Company? That’s really very helpful tool I would say.